Big Trees Lodge Stable is open seasonally from June 3 – September 5, 7:00 am to 5:00 pm. Easy trail rides through gorgeous surroundings are the hallmark of Big Trees Lodge Stable rides. Round trip from Big Trees Stables to the Meadow Loop Trail. 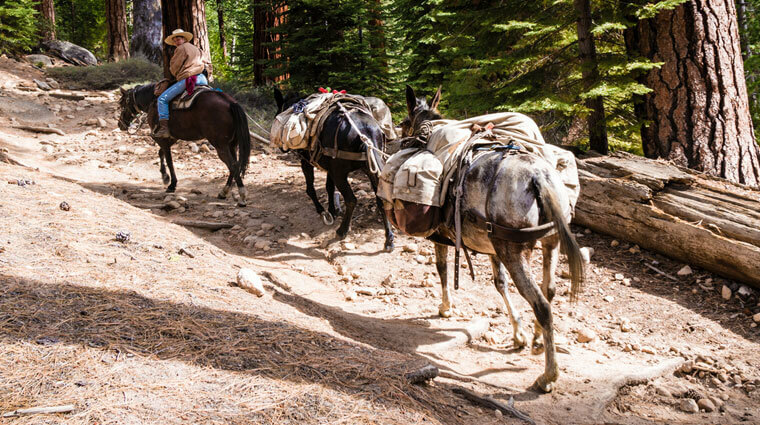 You’ll follow the path of early pioneers on a two-hour ride that traverses the historic wagon road. Ideal for riders of all ages and abilities, the terrain is flat and the riding is gentle. The half-day ride takes riders up into the mountain trails. Please note these trails are often uneven, and can consist of many switchbacks up a steep slope. This is a strenuous ride best suited to riders in good physical condition.